U.S. Sen. Jeanne Shaheen speaks at the climate breakfast in front of images of a recent king tide on the Seacoast. At an annual breakfast Friday in Durham, environmentalists said more federal and local action is needed to slow the effects of climate change. New Hampshire U.S. Sen. Jeanne Shaheen and Rep. Chris Pappas both spoke at the event, saying climate change demands a local response but poses a global existential threat. Pappas says the Trump administration should engage more on the issue with other world powers – such as China and India, both top contributors of carbon emissions. "We need to be leading as an innovator and understand that our economy is inextricably linked to our ability to promote science and address climate change,” he said. The annual breakfast, held at UNH this year and sponsored by the Sierra Club, Union of Concerned Scientists and League of Conservation Voters, centers on how climate change is already affecting New Hampshire’s maple sugaring season, fisheries, coasts and more. Scientists say the warming trend is driving flooding, shortening ski seasons, and creating unpredictability for farmers like Tim Gaudreau, who taps maple trees in the Lakes Region and on the Seacoast. "If the climate system warms up just a little bit out of synch with the other species, your pollinators aren't coming to pollinate those fruit trees, or pollinate your crops,” Gaudreau said during a panel discussion. He says the changing climate is also affecting the timing and reliability of rain, snow and other variables that are crucial to sustainable agriculture. 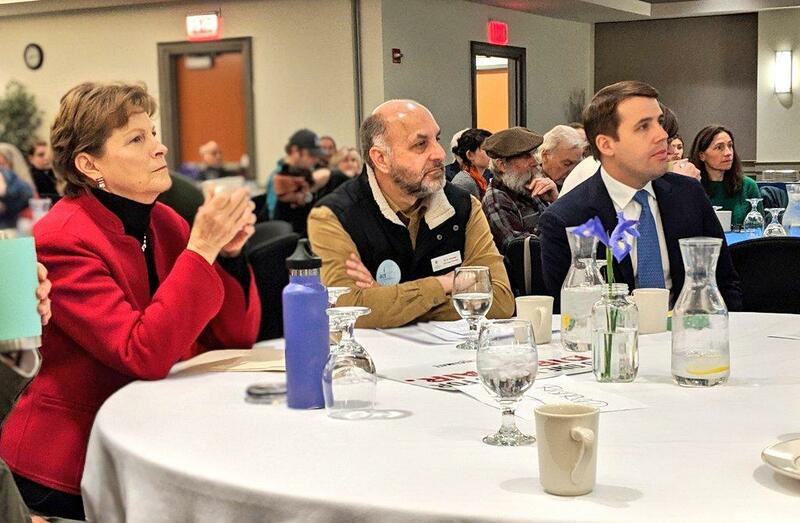 U.S. Sen. Jeanne Shaheen sits with Rep. Chris Pappas, right, and Concord city councilor and state League of Conservation Voters director Rob Werner, center. Advocates at the event urged the students and residents who came to eat pancakes and listen to the speakers to get involved with petitions and statements denouncing regulatory rollbacks and supporting renewable energy. For Portsmouth High School seniors Lucia Trevino and Lydia Fedorowich, the event was another outlet for momentum they felt after last week’s climate-focused school walkouts. They said they feel empowered to be involved in climate advocacy – despite occasional criticism from those who argue the worst effects of a warming climate – and the effects of any action – won’t be felt within current generations’ lifetimes. The two students are co-presidents of Portsmouth High’s Environmental Change Organization, and sit on the city’s blue ribbon committee on sustainability. After taking gap years, Fedorowich hopes to study environmental policy and global development, and Trevino is interested in environmental science and sustainable farming. CORRECTION: An earlier version of this story misidentified the college major plans of Lydia Fedorowich and Lucia Trevino, and misidentified a quote from Fedorowich. This story has been updated. The melty weather in New Hampshire this winter has been a big problem for some kinds of seasonal recreation -- and it’s all part of a long-term warming trend. As this season comes to an end, some of the region's favorite pastimes are preparing for an uncertain future. Windblown Cross Country Skiing and Snowshoeing is tucked into the hills of New Ipswich, New Hampshire, not far from the Massachusetts border. On a bright, brisk Friday in late February, the parking lot is thawing into mud – but the snowy trails that lead into the woods are crisp and freshly groomed.